1. 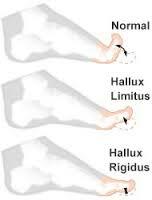 Hallux Limitus is the term podiatrists and other healthcare professionals use to describe loss of motion in your big toe joint. The metatarsophalangeal, or MTP, joint of your big toe is the structure affected by this health problem. Your first MTP joint is the location where your big toe connects to your first metatarsal bone—a long, thin bone that spans your mid-foot and forefoot. 2. Hallux Rigidus is considered by many podiatrists to be the end stage of hallux limitus, or a state in which your ability to create motion in your big toe is lost or severely restricted. Hallux rigidus may lead to long-term damage of your first MTP joint, and it usually involves erosion of your joint cartilage and the development of osteoarthritis, or degenerative joint disease. Hallux rigidus is a condition characterized by near-ankylosis, or a state in which your big toe becomes stiff and immobile due to the partial fusion of your involved bones. With acute injury an initial period of relative rest is needed. Occasionally, the weakened tissues will tear through, resulting in a ruptured achilles tendon. This may require surgical repair and a period of rest before rehabilitation can begin. During this period, however, exercise of the opposite ankle should be encouraged. Vigorous exercise of the uninvolved contralateral ankle muscles produces a neurological stimulus in the injured muscles (the "crossover effect"), and helps to prevent atrophy. Initial treatment also should include heel lifts to reduce the strain on the Achilles tendon, and crossfiber friction to improve circulation. Complete return to function will require attention to range of motion, functional strength and orthotic support. Orthotic support: A shoe insert made with shock-absorbing material will help decrease the amount of stress on the feet, legs, and back during running. Orthotics have been found to be quite useful in the long-term improvement of running biomechanics. While there is still controversy regarding exactly how and why orthotics are so useful, there is solid empirical evidence of their benefits to runners, both for treatment and prevention of overuse injuries. As described above, most Achilles tendon problems develop from poor foot and ankle biomechanics, and control of pronation is needed to prevent recurrent injuries. Custom-made, flexible orthotics are now available that can support the hindfoot, midfoot and forefoot, thereby providing biomechanical control throughout the entire gait cycle. At Advanced Healthcare, Dr. Pisarek has successfully used various physiotherapeutic modalities such as ice, heat, ultrasound and interferrential currents in the management of achilles tendinitis, providing there were no contraindications to treatment present. Over the past few years, Dr. Pisarek has also found that the application of low level laser therapy (LLLT) has shown to be very effective in reducing the pain and inflammation of tendinitis, and, appears to promote healing. Laser therapy for tendinitis may reduce the need for surgery and cut the healing time for tendinitis by as much as 50%. Achilles tendon injuries can be successfully rehabilitated conservatively. Steroid injections and casting are seldom used these days. Once the local inflammation has been controlled, improved blood flow to the region of relative avascularity is necessary. Chiropractic joint mobilization techniques, correct stretching and strengthening exercises can be demonstrated and monitored in Dr. Pisarek's office. One of the most important long-term goals is to reduce any tendency to pronate excessively. In addition to custom-made orthotics (Footmaxx) , all runners should be encouraged to wear well-designed shoes that provide good heel stability with a small amount of additional heel lift. This helps prevent achilles tendon problems, and is especially important in athletes who run more than a few miles at a time.